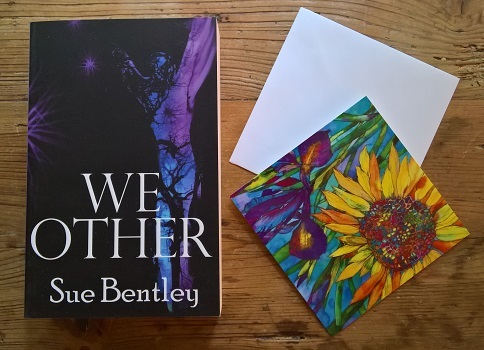 This week on ‘The Writing Life of:‘ I am thrilled to be interviewing author Sue Bentley. Sue will be sharing with us detail of her writing life, telling us all about her latest book ‘We Other‘, which will be released on 6th June 2018, and answering a few fun questions too. Sue Bentley discovered a love of books at an early age. She worked for Northamptonshire Libraries for many years, while teaching herself the craft of writing. She is the author of the worldwide bestselling Magic Kitten, Magic Puppy, Magic Ponies, Magic Bunny series for age 5-9 years. She also writes for children and adults under various pen names. A lover of English Folklore, her books often contain elements of the otherworld and the darkness within the everyday. Her books have been translated into around 20 languages. 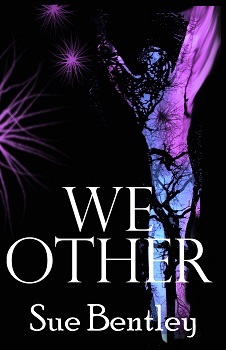 We Other is her first book for Young Adults. An artist or a nurse. I always loved drawing and watching medical dramas. Enid Blyton, Arthur Ransome, Kenneth Grahame, Alan Garner, C S Lewis – so many others. When I read The Lion the Witch and the Wardrobe. Something clicked with that book. I was never the same afterwards. But I didn’t begin writing until my own children started primary school. At first I just read anything and everything – which was part of seeing how a book is created. I absorbed sentence structure, pacing, character building etc – all this somehow seeped in and finally inspired me to start writing. It was a notebook and pencil at first, the text soon became illegible with all the crossings out and inserts. Thank goodness for my desktop PC, which I now type straight onto. I wrote a lot of very bad fiction and made every mistake in the book, but I kept on. I joined a writers’ group and when that didn’t work for me, I started up my own. There were three of us, all keen to become authors. We supported each other, criticised each other’s work, went on the occasional course and kept on writing through good days and bad. Eventually, we were all published. When hard at work on a book I aim for around 1,000 words, which I then edit the following day before pressing on. I have written under a variety of pseudonyms and contributed to existing series for children as Lucy Daniels, Daisy Meadows and Kate Bloom, amongst others. Apart from drinking endless cups of tea, nibbling chocolate peanuts and writing in PJs, a fleece, and slipper-boots, not really. I prefer to make notes with cheap plastic propelling pencils. The little eraser on the end is very useful as I’m constantly adding things, rubbing words out or enlarging on a subject. I write straight on to my desk top, sometimes onto a laptop, and jot down notes in longhand. I have a bad stationery habit. Can’t resist a handsome notebook or propelling pencil, the brighter and more garish the better. Over 70 up to now. I’m presently looking for a publisher for my WIP, entitled ‘Second Skin’ which is another dark fantasy, part romance/part thriller. It’s on a huge scale and is totally different to We Other. I’m a plotter but usually turn into a pantser during the process. It all comes together in the end, after lots of editing. I do read them. Mostly they’re good but I’ve had a couple of stinkers. The temptation is to respond, but commenting on negative comments is a waste of time and energy. As Anthony Hopkins says, ‘What you think of me (or my work) is none of my business.’ Wise words. Far longer than I’d planned! Some books I’ve written quickly, others demanded more ‘birthing’ time. We Other wanted to linger in the warm darkness until I dragged it kicking and screaming into the sunlight! Sometimes come out of the blue. Other times I chase them down by looking through lists online, in magazines etc. We Other is primarily Jess Morgan’s story. She’s the child of an alcoholic single mum who has emotional baggage and unresolved grief issues. Jess is spiky, awkward and a loner, but has a heart of gold. Caleb Farmer is another main character. He’s trapped by the responsibilities of keeping the failing family business afloat. Although desperate to pursue a career as an artist, he has to contend with a bullying father and a browbeaten mum. Jess and Caleb’s journeys through We Other tests them to their core, while bringing them into dangerous realms of darkness, beauty and peril. All scenes are hard to write. I’m a perfectionist, so spend a lot of time getting things exactly right. Action scenes flow more smoothly than ‘linking’ parts of the narrative. We Other, came to me easily. It’s a perfect fit. In the context of this book, ‘Other’ means different or set apart, in the widest sense of the word. Usually members of my writing group. We all read each other’s work. At a later stage, my agent also provides valuable advice. Approaching publishers is usually via my agent, but I may contact them direct. In my early days I sent off scripts and collected rejections – loads of them. With digital publishers asking for online submissions, it’s easier to submit work. But my agent would manage the business side. I’d like to say I jump about and punch the air. But I just felt a huge sense of relief with We Other. It took me the longest time to write and I was worn out at the end of it. I’ve just finished a first draft of ‘Second Skin’ first of a new series, and I’m about to do some major editing. It’s about what happens when different races collide and asks ‘what shape is love?’ Aledra is a Drakkoni, shape-shifters and conquerors of Esra. Jubal is a Native Esran who has witnessed the slaughter of his people by the hated Drakkoni. Aledra and Jubal go on a journey which will stretch, friendship faith and love to its limits. I’m also in the planning stages of ‘Scar You’ which will revisit characters from ‘We Other’ and introduce exciting new ones. Baked potatoes with anything. Avocado and salad. Chocolate peanuts. Anything with lemon or chocolate in it. Bladerunner and the latest sequel. And Avatar. All masterpieces. Waterloo Sunset by the Kinks. A piece of land with a forest, lake and space to build houses for all my family. Here are the sunglasses you lost. I ‘borrowed’ them when I was in the queue behind you in Sainsbury’s check-out. (So that’s where they went!) Well you did ask. You can find out more about Sue Bentley by visiting the website/social media sites below. I would like to say a big thank you to Sue for sharing with us details of her writing life, and for a wonderful interview. I had no idea Sue Bentley is behind Daisy Meadows! My daughter loved them so much when she was younger, we used to hunt them down and still have them! Can’t give them away! This is a fun interview, as I can connect with so much. I was also attached to a notebook at a young age and still have about five notebooks lurking in my handbag. Just in case… I am amazed at the sheer number of stories Sue has written, and I am in awe of the power of her imagination. I hope Sue manages to buy a forest and lake. I know We Other will be a great book and can’t wait to delve in. Thanks for commenting. I always have loads of notebooks too. Over 70 books! I’m impressed. I love finding out more about other authors. I know, so impressive writing that many. Great interview! I don’t know much about Sue Bentley, but the synopsis of this book looks really good. Fabulous interview. My daughter loved the Animal Ark series and Daisy Meadows. Thank you. The kids books are very popular. I know lots of people who loved/love them. 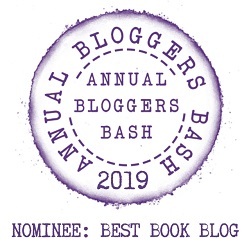 Brilliant interview, I really enjoyed reading it and a fab competition to enter. Lovely interview!! I too am a big fan of The Lion, the Witch, and the Wardrobe. I see a reread in my future – ty for the inspiration! Thanks Nikki. I only ever read the first book. Wasn’t until I was an adult that I realised there were more books and that it was a series. The Lion the Witch and the Wardrobe was also what sparked my reading as a child. I had the same reaction to it as she did. Great when a book really captures your imagination. Such a terrific interview with great question – and answers. We Others sounds fascinating. I can’t wait to read it! Thank you. Hope you get to read it sometime. Thank you. I love baked potatoes too. Great interview she is a new author to me and her book looks and sounds very intriguing! Thank you so much for sharing your awesome post. Than you. Glad you enjoy it. She’s Daisy Meadows! We know that name well around this house. Good interview 😀 Omg, I can’t believe Sue loves the Bladerunner sequel,I love Bladerunner 2049, too!! The visuals in it are stunning! I have a horrible notebook addiction, as well 🙂 Great interview!